Most of Europe has fallen to Hitler, leaving Britain as the last remaining European power resisting Nazi expansion and teetering dangerously close to succumbing to the more powerful German war-machine. Desperate for the assistance of the United States, Churchill repeatedly made pleas to FDR to become more directly involved in the conflict through the supply of materiel needed to support their defenses. The American people were still divided about getting involved in yet another European conflict that was “an ocean away” (the isolationist’s lament), which bound FDR’s hands in support of Britain. We could not declare war, as the will was not there, nor could we simply provide considerable valuable resources when America itself was recovering from the Great Depression. Through ingenious political maneuvering, FDR was able to accomplish this support through such programs as, “Lend-Lease”, which allowed us to provide supplies in return for very generous concessions by Britain…but the main purpose was to have “Lend-Lease” so heavily favor the US, that there would be little issue taken by FDR’s political opponents (or the public), yet still accomplish the goal of “indirectly” assisting Britain. This was a vital, albeit small, lifeline to buy England’s defense against Germany a little more time. Interestingly enough, many American politicians felt that it was simply a matter of time before Britain fell and most did not feel that Churchill was the man for the job. Among them was Joe Kennedy, the American Ambassador to England at the time and a shameless Isolationist. What changed the tide in England’s favor, at least in the minds of those who felt she was doomed, was after it appeared obvious that Hitler was going to take France. Dana – you ask – “what could possibly have happened to change these men’s minds simply over the inevitable fall of France?” The answer is this: Churchill made the decision to bomb the French Navy before Hitler had an opportunity to seize it and use it to grow the Germany Navy against Britain. This one act of defiance was all the proof that was needed for Churchill’s detractors to finally realize that the Prime Minister (and his countrymen) had no intention of capitulating to the enemy and would continue to fight even if it meant the destruction of their Empire. By bombing the French Navy, in one act, Churchill proved that there would be no surrender coming from Britain. This changed the ball game…at least for FDR and for those providing resistance to support. The American people would not support an unprovoked declaration of war against a nation that did not attack us and was an ocean away…something else had to happen if the US was to become involved. Many WWII buffs speculate (myself included) that due to the American people’s unwillingness to get involved in another war in Europe – keep in mind we just got out of WWI not too long ago, most Americans felt we were safe due to distance and the Great Depression had not yet ended – FDR (in a little known fact) cut off oil and iron exports to Japan in what was perhaps a strategic move to force their hand. Knowing this would cripple their powerful Navy (as they relied heavily on US oil and iron, since we were a top producer of both at the time), Pearl Harbor was a preemptive move to keep the United States out of the war while Japan still had the power and resources to attack effectively…this of course had the opposite effect. Japan started planning the Pearl Harbor attack only months after FDR’s decision to cut off their oil and iron supplies. Realizing they had enough reserves to keep their Navy performing for only a couple more years, the intent was to remove the US from the equation as it pertained to Japan’s plans in the Pacific and throughout Southeast Asia. Had it not been for the fact that multiple US aircraft carriers were out to sea at the time of the attack, Japan might very well have succeeded in crippling our entire Pacific Fleet. It also just so happens (*wink*) that dozens more were being produced at FDR’s order. Since Americans were not too keen on military spending / war preparation during the Depression, FDR was able to convince Congress to approve the production in the interest of “building a strong national defense against the possible aggression of other nations”. Key word here, “defense” and not “offense”…which allowed us to start production and shoring up the military – effectively a head-start (preparation) – before we actually became involved in WWII. As we all know, on December 8th 1941, the United States declared war on Japan…and 3 day’s later, on December 11th, Germany and Italy declared war on us. The United States never declared war on Germany or Italy, only Japan. Hitler’s decision to declare war on the United States is considered a major strategic blunder, as it was the only way in which FDR would be able to directly support and eventually fight alongside Britain and her allies in Europe, as Pearl Harbor was not a blank check to also include Germany / Italy. Had Hitler (or Mussolini) not declared war on the United States – understandable however, as Japan was their ally – we may have only been engaged in the Pacific and eventually been able to make our way into the European theatre…but by then it would have been too late. The facts are the facts. 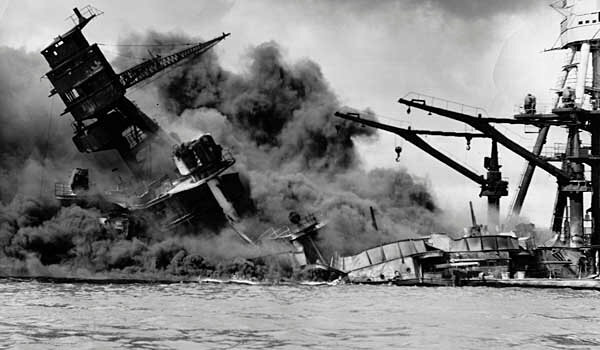 However, whether FDR intentionally cut off oil and iron to Japan in an orchestrated attempt to force their hand is up for speculation…and if so, he certainly could not have predicted that the attack on Pearl Harbor would be their response. For anyone who has read about FDR extensively (I have, as he is my favorite President), this level of calculation is not a surprise. German U-boats had attacked American merchant ships in the Atlantic and it had yet to get a strong reaction from the American people and be considered an act of war. Perhaps the incredible violence and ‘sneak attack’ nature of Pearl Harbor was the only thing that it could take to elicit that reaction. After all, we have had terrorist attacks in this country before 9/11 (i.e. first attempt at World Trade Center, Oklahoma City bombing etc)…but it took 9/11 to make people engaged and enraged enough to react. As I mention on my show often when discussing history, Pearl Harbor and WWII were undoubtedly the catalysts for the United States status as a World Power and as eventual sole Super Power. Prior to WWII, the US had the 17th largest military in the World…it catapulted to roughly 15 million enlisted during WWII. The manufacturing and mobilization that occurred during the war effort created a tremendous economy, put people back to work and ingrained a Nationalistic spirit in the American people. The subsequent Cold War with the Soviet Union kept us on top, for the simple fact of competing against them and developing some of the most advanced technology beyond what the rest of the world was working on. It cemented our military at the ‘top of the food’ chain and it hasn’t looked back since. It modernized production and produced one of the greatest generations in human history. “The Pacific” starts on HBO this Sunday at 9pm!! !